Though most of us don’t consider it when we are mindlessly chowing down on the butter soaked fluffy starch at movies, popcorn serves as the mingling ground for multiple fundamental scientific ideas. Principally, the act of popcorn popping deals with the idea of water vaporization. Popcorn is a seed containing the endosperm of the plant surrounded by the yellow-orange hull. Inside the kernel there is a significant amount of water (about 15% of the kernel is water). When the popcorn is heated, the water vaporizes and expands, which eventually exerts enough pressure on the hull so that the popcorn explodes. When this happens, it can be said that the popcorn undergoes a physical change because the chemical composition of the corn is not altered. Additionally, assuming that the water vapor does not leave the system, the popcorn should not experience a change in mass when it transitions from its kernel state to its fluffy popcorn state. To demonstrate these principles, we first popped a kernel of popcorn in a test tube over a candle and allowed the steam to escape so that they could see that there had been water in the system which vaporized. After they grasped this concept, we allowed the students to explore the concept of preservation of mass. To do so, we weighed a half cup of un-popped popcorn kernels and recorded the weights. We then had the students pop the kernels and reweigh them to see how the mass had changed. Most had predicted that the mass would decrease because they were light and fluffy once they popped. In actuality, we did see a decrease in mass, which was probably due to a combination of hungry students and the loss of water vapor. Though we didn’t address it in this lesson, it would have been relevant to discuss the concept of density. As we munched on the plain popcorn, we discussed how the popcorn was kind of bland, and how we could add different flavors to make it yummier to snack on. 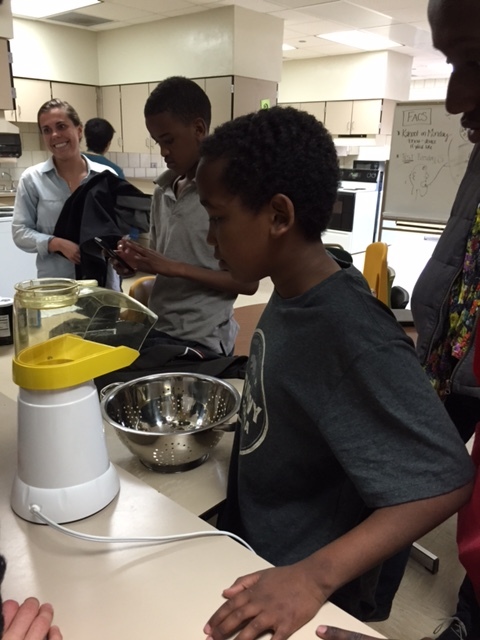 At Northfield Middle School, the kids then divided into four separate groups and each followed a topping recipe to spice up the popcorn a little bit. The flavors included apple pie, maple brown sugar, soy sauce-wasabi, and rosemary/garlic/Parmesan. The kids loved all of the types of popcorn, but they were especially keen on the apple pie popcorn and gobbled it all up within minutes. At Faribault we again had a fairly low turnout and so we decided to split into two groups instead of four. 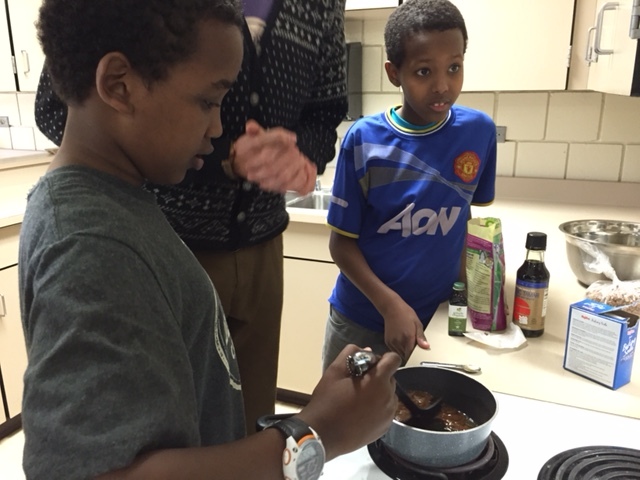 Rather than adhering to a recipe, these groups focused on the concept of culinary creativity to create flavors that strayed from our recipes. They ended up with a burnt salted caramel, a brown sugar, a Parmesan and rosemary and a “spicy spicy” (garlic, pepper flakes, wasabi and soy sauce) flavored snack. 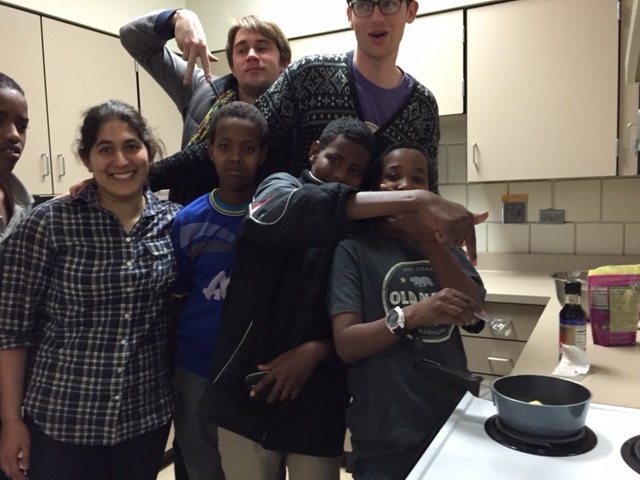 Again, the popcorn was incredibly successful, but the students particularly enjoyed the brown sugar variety. It is safe to say that from a culinary angle, the popcorn was an enormous hit. 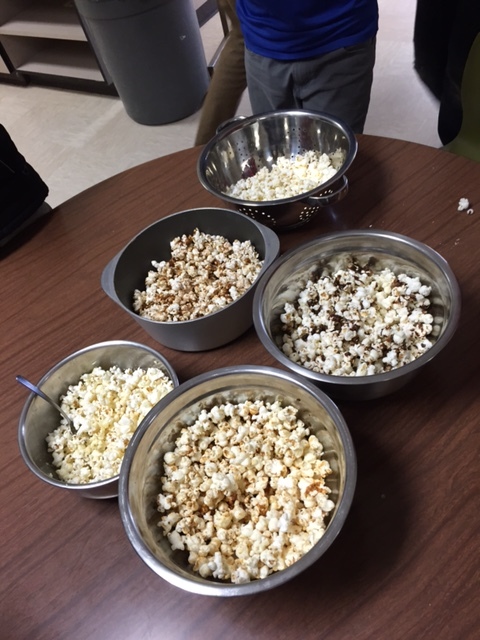 The strength of the lesson was only weakened by the fact that the weights of the popcorn were inconsistent so the concept of conservation of mass was not effectively taught. 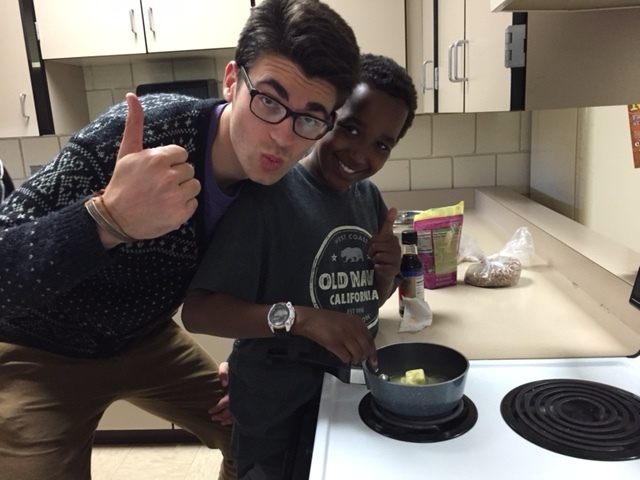 Aside from this, the lesson was effective because, not only were the students eager to try the perhaps unfamiliar combinations, but they embraced the freedom and challenge of culinary creativity and wound up with incredible creations.